I wish I had known these before I applied for a mortgage. Problem is once you apply, it’s too late if you don’t adhere to the rules mentioned above. It’s a shame the banks don’t make these rules more clear to the general public. #4 is not specifically correct. Medical collections are not usually considered in the underwriting process. In addition adding a dispute to a credit report will prevent any loan from closing, the dispute will have be removed. When the dispute is removed it will be counted as an active debt and credit scores will go down. I should specify that disputing these items long before you apply for a mortgage will help. Perhaps a few months. That way you can get them removed and restore any related credit score damage before beginning the mortgage process. In the article it says medical debts crush your fico. I spoke to a lender about my situation and he said medical doesn’t really have any bearing on how they figure score. Told me not to worry about my medical judgment. Can anyone elaborate on that? The new FICO score (FICO® Score 9) greatly reduces the impact of medical collections because the brains at FICO realized they aren’t representative of increased credit risk, and therefore their impact on credit scores should be low. But that assumes the lender is using FICO 9 and not an earlier model. Either way, it makes sense to remove/dispute medical collections before applying for a mortgage to ensure your score is as high as possible. What type of rent documentation is required for mortgage loan approval? While looking through 12 months of electronic documentation, I saw that there were a few months that were paid a few days late, but less than 30. Will we not qualify for a mortgage as a result? I do not have cancelled check to provide, just electronic records that show the late fees. My credit score is good otherwise. Thanks. Generally, a verification of rent form will ask for 30-day late payments, not payments made a few days late. It depends on your credit score, assets, income, etc., but the collection itself may not be an issue depending on loan type and your other borrower attributes. 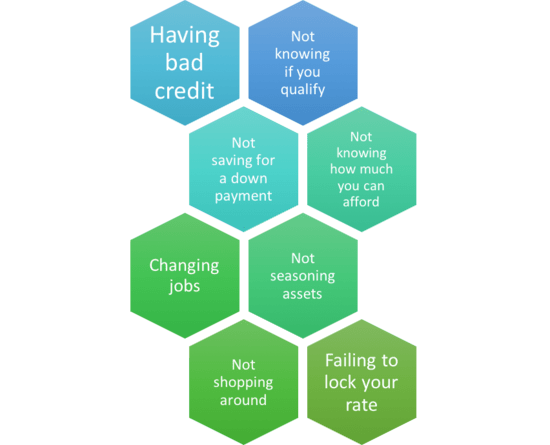 Might be a low credit score that’s the problem? There are lenders that specialize in foreign nationals and non-resident aliens. I have purchased many homes and hung out with my parents during their real estate business wheeling and dealing days and still browse the net for updated advice / reinforcement on what I already know. I learn something new or see a new perspective all the time. These are such good points, but for most first time buyers they mere abstractions. They just want that first house so very badly. It takes a couple of times through the buy-pay-sell cycle to appreciate. can i get approved if i have no rental history? If you don’t have rental history you’ll likely just need to explain what you’ve been doing (for housing) and prove that you can handle mortgage payments going forward. Can you please give me advice? I have to give you some background so I apologize for the length. I have always relied on my husband but a couple yrs ago he suffered a severe blood clot and developed a pain disorder. He has not been able to work since. Our landlord, who is very compassionate, allowed me to work for rent often reducing or eliminating rent. Some months we would pay in full but it would be middle end of the month. At the time I was making between $150-$200 a week supporting a family of 4 and making excessive trips for doctors tests therapists etc. Often 1 hr travel 1 way. My credit took a bit of a hit too. Anyway, I’ve been working hard to get things stable. I now work a job where I bring home $360 a week plus a 2nd job that’s an on call gig but made 5k in 2015. My credit is improving, no lates in 12 months on credit cards. Middle Fico is a 620. We want to buy a house for $50k 5% down. If we can get it, it will save us $100 a month over renting…I just don’t know how this rent thing will affect us…Will the low price of the house make a difference? Lender calculations are telling me U can afford $120k but I’m only trying to get $50 any advice… I’m so sad because I though I was doing so well. Instead of speculating you’ll probably want to get pre-approved to see exactly what you qualify for based on all the numbers. And if you’re concerned the rent thing could hurt you, it may make sense to explain it upfront with a broker or loan officer that knows how to navigate the situation. Good luck! Question: if you have old unpaid debts (from 9yr ago) and it not on credit report (and not sure who to pay the debt to) when applying for a home loan will lenders see that past unpaid debt? I suppose it depends who can see those unpaid debts and where they actually show up. Chances are a lender may not see them if they’ve already fallen off your credit report. A few questions…1) what documents are required for rent history…a letter from the rental company? 2) i have been self employed for two years with a small income but recently started employment with a good salary…it’s only been a couple months…is there any chance I could still qualify with just a handful of paychecks…if I could show and employment contract would that help? Any tips? And 3) how do you even start…is there a certain bank/lender that specializes in FHA loans or first time home buyers? I’m a little lost on where to even begin. Thanks! Either VOR (verification of rent form) or cancelled checks for some period, typically 12 months. It might be tough to use income that is brand new unless it’s something you can prove will definitely continue for the foreseeable future. A broker might be helpful for you because they can advise you and send your loan application to a specific lender whereas a single bank will just kind of tell you if you’re approved or not with them. I might be short for closing. Can I make a large deposit (30k) from my SCorp (100% owned) to my personal during underwriter processed? Thank you ! Best to ask your loan officer or broker to be sure. Best to ask your lender directly to know 100%. Me and my wife Prequalified for a 150k mortgage for a house house and later decided to purchase a cheaper house (the one we have been renting for three years) we just acquired a purchase agreement contract and have an appointment with the bank in a few days. The thing that has me nervous is my wife (co-borrower) has a few medical bills in collection but her credit score is in the high 600’s..I myself (borrower) don’t have any delinquent debts and have good credit..I am nervous about being denied because of those.. but i keep reading mixed responses about medical debt. most say eliminate them for a higher credit score (no brainer) but if your credit isn’t that bad anyways are they grounds for a denial? As you said, removing them would likely make her credit score jump considerably, but if you can get approved regardless it might not matter. However, a lower credit score could result in a higher mortgage rate, so you could see about removing them (might be to late now) or possibly see if you can qualify without her if her credit hurts your overall application. I bought a house 10 years ago. rigth now my mortgage is 20 years. I know the first 10 years you pay interes only. I want to refi. my house but I can’t proof my income because, I’m self employee. my self is in the mortgage and my husband is in the title. inconme for 2015, he report : 40,000 and I report 72,000 inconme from the house. We report the 40,000 from him, because we want to refi. next years and we plan to take me from the mortgage and put my husband in the mortgage and title. Can we do that and how is work. I am about to close a house, and the bank is requiring proof of rent payment. I have money overseas outside the united states (That I have proof of), and brought in some cash with a relative from my overseas bank account. I used that money to pay few months of rent in cash to my current landlord. I have cash receipts from the LL as well as a copy of the lease. Is this an automatic denial on my loan? I am very nervous as my closing date is supposed to be in 2 weeks. The lender may want a letter of explanation to determine why you used a relative’s money to pay your rent and ensure you have the necessary funds to make your own rental payments and subsequent mortgage payments. If it can be reasonably explained it may not be grounds for denial. Is there anyway around the two year employment thing? High down payment? Co-signer? Etc? It’s possible depending on the loan and situation…the two-year thing is a general rule to avoid further scrutinization. Certainly no reason to give up until explicitly denied on this basis. Very helpful. I have VOR question. When my wife and I got married I moved in with her to her apartment. I wire her money and she pays the rent. I just applied for a mortgage without her and the bank wants to verify my rent payments. Turns out my wife has paid the rent late quite a few times even though i sent her the money on the first of each month. Can this somehow be attributed to me and be a grounds for denial? I can prove that I wired her the rent amount on time each month. It might not be an issue if the payments are only a few days late and not reported as delinquent (generally 30+ days late), but if they are your explanation may hold water if you can document it all. Good luck. This is a GREAT ARTICLE about a horribly f****d up industry. Buyers looking for jumbo loans need to be especially aware of #9. “You generally need at least 3 credit tradelines…” This is one of the very rare articles that even mentions this. I prepared for a house purchase for well over a year as we patiently waited to find our dream home, relying on a mortgage broker who pulled my credit and examined my returns and issued pre-approval and assured me all requirements were met. Today I discovered that even with high Fico, high income, and perfect payment history I may not qualify because I dared to buy my cars in cash and only have two credit cards. Not once did the idiot mortgage broker mention this in all the time he worked with me. I’m so angry right now I’d like to beat the crap out of him, and I can’t believe this messed up industry can function this way. There should be a standard set of guidelines readily available for consumers. And I did do my best to educated myself, but never once did I see this mentioned in all the articles I read. Just the opposite, all every freaking article tells you is to not get new credit. Sorry you didn’t come across this tip earlier…yes, if you eschew credit it’s difficult to get other credit, such as a mortgage. I am kind of in a sticky situation here. We arranged for a loan from PNC bank, with an agent who is very lazy as hell. We had no idea he would be this lazy and careless. He promised us we will have the mortgage ready before closing within 30 days. He never entered correct information in our documents, which is why we still haven’t signed the mortgage agreement documents yet.He promised it will be corrected soon, but it’s been a week and he has still not corrected anything and it’s only 2 weeks to closing now, is it too late to switch mortgages or is i a better idea to switch to a different branch of PNC, without losing appraisal money and other details. Please advice. Might be tough to switch and close with so little time left…unfortunately you don’t know if the next bank/lender will be just as bad. Sadly, this is kind of how the mortgage industry works – lots of delays amid critical timelines with inconsistent service. My husband son and I live in my Grandmothers home. I have always lived here and in the last 3 yrs have not worked due to her failing health. My husband has been on workers comp for 3 yrs as well due to having 3 surgeries from the injury and is in the process of being approved for re training. My Grandmother got a reverse mortgage about 6 yrs ago and we would like to buy the house for that balance. I would start working again either for myself or someone once I am no longer her caregiver and we could afford the mortgage payment, taxes and all but how difficult will it be to get approved with decent credit and no debts. Is it even possible for a retired person with low S.S. payments ($589 per month) to get a loan on a $27,000 (trailer) home? I’ve had a small account at the local bank for 5 years. I have no co-signer or collateral except my 2005 Dodge Neon, which is in good shape. My credit is between Fair and Acceptable. The only thing I bought on credit was my first car, in 1969. And, can the loan be slightly higher than purchase amount? I have roughly $10,000 on hand in cash, PayPal, and recent uncashed checks. Thank you!